Worldwide The global report from the World Health Organization (WHO), published in 2016, estimated that 422 million adults live with diabetes and that the number of diabetic patients has increased four times over in the adult population, when compared to 108 million adults living with diabetes in 1980. The World Health Organization has estimated that the number of diabetic patients will double by 2030. The prevalence of diabetes is increasing more rapidly in low- and medium-income groups than in higher-income groups, as well as in developing countries compared to European countries, where there are fewer cases of diabetes. The top six countries with the highest prevalence of diabetes include India, China, the USA, the UK, Brazil, and Indonesia. Mozambique is located on the East Coast of Africa 1 (Wikipedia, 2016). According to a 2015 report (IDF, 2015), there are 274,700 diabetic patients in Mozambique, and 9,716 deaths have occurred there from diabetes. Mozambique is the setting for this study. A sample of 648 participants was taken for this study. This study was conducted on regular patients of the diabetic outpatient department of the Central Hospital of Nampula. The study investigated the effects of three sessions of the diabetes education program (baseline, first follow-up and second follow-up) on each patient at one-month intervals. The inclusion criteria for participating in the diabetes education program dictated that patients should be in the OPD, willing to participate in the education sessions and willing to give consent to be included in the study. Participants were excluded if they had already completed three sessions of education or if they lived in a district that made it impossible for them to return within one month to the next education session. Among the group instructors were a diabetologist, dietician, psychologist, physiotherapist, and diabetic nurse. There was a pre-test questionnaire that aimed to assess the existing knowledge of diabetes before starting the baseline education session. The same questions were asked after the completion of the second follow-up education session. There were various variables to assess from baseline to second follow up education session. The topics of education were chosen according to the local culture, socioeconomic condition, beliefs, lifestyle, and common complications and their associated diseases to improve the outcome of diabetes and to prevent complications. Weight, blood pressure, and body mass index (BMI) were taken before each session, and each patient was asked to do an analysis before day one of the session and provide the results of the plasma gucose and cholesterol report to be registered by a diabetes nurse. There was an interval of one month between each session and three educational sessions. All of the educational sessions were verbal, demonstrated real activity, and were made available in the Portuguese language. A statistical analysis was conducted. The Statistical Program for the Social Sciences (SPSS), version 17.0, was utilized. Table 3 Correlation among variables plasma glucose and systolic blood pressure. N=648 ** Correlation is significant at the P<=0.01 level (2-tailed). * Correlation is significant at the P<=0.05 level (2-tailed). Table 4 Correlation among variables plasma glucose and dystolic blood pressure. N =648 ** Correlation is significant at the P<=0.01 level (2-tailed). 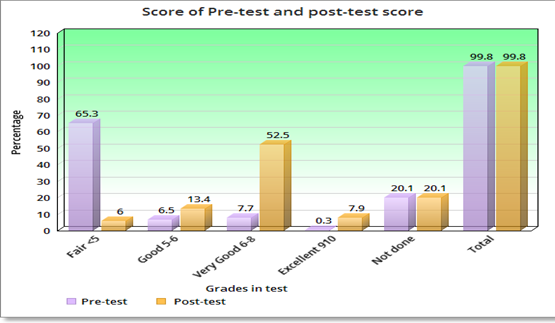 Figure 1 Pre-testand post-test score at before baseline and after second follow up. A sample of 648 patients with diabetes mellitus, who had participated in educational sessions regarding diabetes, was taken for study in order to determine the effect of education on improving outcomes in diabetes. The mean and standard deviation were calculated using plan coding, without grouping into categories. For the evaluation of basic knowledge, regarding diabetes mellitus prior to participating in the baseline education sessions, and assessment was performed of the pretest score. (SD=19.95 mmHg), with an average diastolic blood pressure at the second follow up of 68.79 mmHg (SD=11.33 mmHg). As seen from baseline to the second follow up, a gradual decrease in both systolic and diastolic blood pressure was observed. Systolic pressure F =6.330 and p=< 0.001. The present study found that educational intervention was highly effective in controlling anthropometric parameters (BMI and blood pressure), as these had significantly decreased from baseline at the second patient follow up visit. Metabolic control (plasma glucose, cholesterol concentrations) also showed a significant positive correlation amongs variables and improvement from baseline at the second follow up visit. Finally, participants also showed an improvement in knowledge through diabetes education. The knowledge provided by the education helped the participants to improve and change their lifestyle, especially their dietary and exercise habits, their psychological adjustment and their attitude to living with diabetes. Similar studies have previously been performed, with some comparable findings being reported. Newly diagnosed diabetic patients need self–management education, as this helps to increase their level of knowledge of diabetes and to provide them with skills to manage their diabetes life long, as it is a chronic condition (American Diabetes Association, 2014). A Cochrane review (Deakin, 2009) concluded that a reduction in plasma glucose concentrations, reduced HbA1c, reduced BMI, reduced systolic blood pressure and reduced medication doses and increased knowledge of diabetes. A Cochrane review (Deakin, 2009) concluded that through group education of diabetes patients get motivated, start adherence to treatment and understand diabetes. The study performed by Balagopal et al. (2008) showed reduced levels of obesity and improved dietary habits of diabetic and pre-diabetic patients after education regarding diabetes. The lifestyle modifications were effective in reducing a number of the risk factors for type 2 diabetes mellitus and in improving self-management of the disease. Diabetes mellitus is a chronic and progressive disease, the prevalence of which is rapidly increasing. Uncontrolled diabetes mellitus may cause severe and irreversible untreatable complications, such as cardiovascular disease, retinopathy, nephropathy and cataract development. There is therefore a need to control anthropometric and metabolic parameters within an acceptable range in order to avoid the development of complications. Diabetes education was performed with general and specific groups of patients according to the needs of the patients, the complications of the diabetes mellitus and other diseases associated with them. Three education sessions were organized, at an interval of one month (baseline, first follow up and second follow up). Each participant was evaluated in each session regarding their BMI, blood pressure, plasma glucose, cholesterol concentrations. The statistical analysis showed strong significantly positive correlation among variables effects on controlling each of these parameters. Prior to the commencement of the baseline education session, an evaluation of the evolution of patient knowledge regarding diabetes mellitus (the pretest) was performed. At the end of the second follow up, a posttest was performed, which showed strong significant increases in the knowledge of diabetes. There is currently a need to design a national policy and program for diabetes education. Clinicians and health educators should continue to reemphasize that patients with diabetes mellitus make healthy behavioral changes in order to control their diabetes and reduce the occurrence of complications. The limitations of this study include that some of the diabetic patients used traditional medications, some did not adhere to treatment, and some were lost to follow up, all of which can cause uncontrollable diabetes and increase the incidence of complications. Patients were very interested in taking medicine free of charge in a government hospital. Limitations were also found here, such as the intermittent non-availability of the results of blood sugar concentrations and other biochemical results due to a lack of laboratory reagents. Patients who lived district, distance from the hospital, were not able to regularly attend three education sessions. Patients were more interested in obtaining medication than on lifestyle modification. Patients were generally from a poor or lower income group and were unable to buy the recommended food. It was also noted that some patients had an insufficient economic condition to take small and frequent meals. Some of the patients presented with a delayed diagnosis, with irreversible complications. One of the strengths of this study is that patients, at the commencement of educational sessions, were encouraged to participate and to bring laboratory results and other activities to the follow up sessions by reminding them that they would receive prescription medicine at the end of the successful completion of all the essential activities involved in the education sessions. This encouraged patients to take a further interest in the study, and most of these patients then implemented the required changes in their lives and achieved positive significant outcomes in controlling their diabetes.